The other day at approximately 5 p.m., the 7th grader announced there was a documentary called “Raising Ms. President” playing at 6 p.m. at our local movie theater that she wanted to see. It was about encouraging girls to think of running for government office. So I took her. How could I not? Besides, I was able to abandon cooking dinner and eat popcorn instead. It was a good documentary. It almost made me want to run for office. I enjoyed some fantasies of me at a podium, but then I remembered who I am. Here’s why I’m not a government leader: the butter dish. You see, I have taken to heart President Obama’s advice about streamlining your decisions so you have energy to focus on the important things. And I understand that to implement that advice that it’s a good idea to turn things automatic, so that you can just do them habitually, without deciding every single time that you’re going to do them. For the President, that means, as I’ve mentioned, only wearing blue or grey suits. No decisions needed. Just put on the uniform. For me, that means for example, sun salutations. I have been keeping my Jerry Seinfeldian chain going, doing sun salutations every single morning, first thing, in my pajamas. This has been going for weeks. I can’t say exactly how many weeks, because I didn’t note the day I started. I just started. I think that’s better for me. I’m such a type B, I have to sidle into a routine, otherwise I’ll keep procrastinating, or my innate contrariness kicks in and I can’t allow myself to stick to it. If I were Type A, I could take it up with more fanfare. Buy a calendar, mark it off with Xxxs every day after I finished. But that is not me. That kind of commitment to good scares me. If I made a big thing out of it and told everyone I was starting a new routine, then I’d probably have to intentionally screw it up, just to show myself I wasn’t the boss of me. That’s how contrary I am. Yea, now we get to why I’m not running for president. Or even school board. So instead of with fanfare and an actual calendar and red pen, I work with a virtual calendar in my head. I started this little routine, and now, even on the days when I feel like my head is stuffed with cotton when I wake up, I hear my little inner voice saying, “don’t break the chain” and I get up and do my sun salutations in my pajamas. It’s become automatic. Success. However, I was talking about the butter dish. The other morning, I used up the last bit of butter. Naturally, the dish was a mess of old butter remnants. I’ve failed to teach my children how to take a pat of butter properly, because the dish is always a disaster. So I wanted the dish clean before I opened another stick of butter. So I thought about putting it in the dishwasher, but we wouldn’t be running it until after dinner and then the butter dish wouldn’t be ready for use until the next day. And I actually wanted to use some butter in just a little while. Before the dishwasher would be run. What to do? What to do? A question as difficult as what to do about Israel and the rest of the Middle East. Readers, I pondered this. 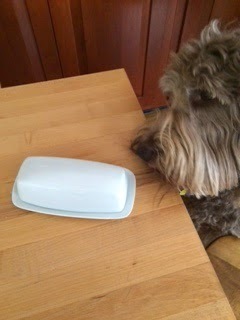 Yes, I pondered the butter dish dishwasher problem. For minutes. Minutes, I tell you. Granted, it was early in the morning. And I hadn’t yet discovered the 5 Tibetan Rites (to be discussed in a future post). So my brain was a little slow, perhaps. But, yes, minutes passed. Finally, a solution arrived in my brain. I could wash the butter dish right now, with a sponge and soap. I could even dry the butter dish with a dish towel. And then – my goodness, the brilliance – I could open up a new stick of butter and make myself an egg. Why this decision took so much time befuddles me. It was anything but automatic. It and so many other small – I mean hugely important – decisions gunk up my day. It’s exhausting. Which is why I’m not running for president.